New York rallies for Ahed Tamimi’s birthday | Fight Back! 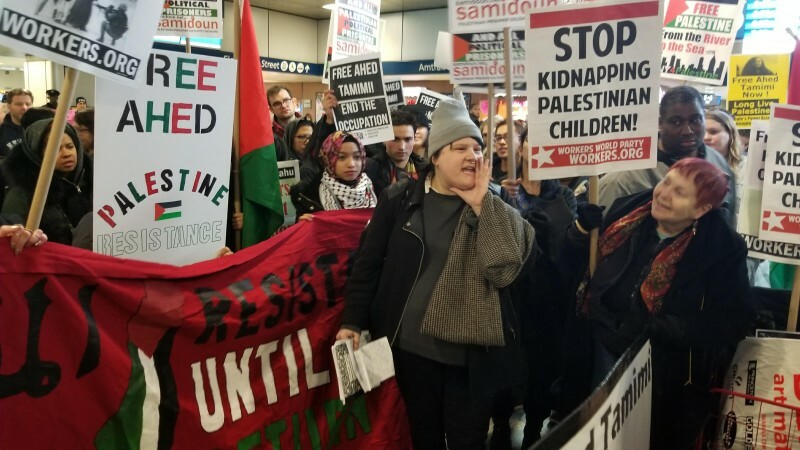 New York, NY — Approximately 100 people gathered in Penn Station during rush hour, Jan. 30, to demand justice for Ahed Tamimi. The action was called by the NY4Palestine coalition. The rally was part of a national day of action, called to not only celebrate Tamimi’s 17th birthday, but to stand in solidarity with her on the first day on trial. Tamimi was arrested in December for slapping an Israel Defense Forces soldier who had just shot her cousin with a rubber bullet. Tamimi’s case has become emblematic of the Palestinian liberation movement because it shows a courage of a young girl standing up to fully armed soldiers. People throughout the world have been standing in solidarity with Tamimi and her family. Jessica Schwartz, from the Committee to Stop FBI Repression, spoke about how Israeli prisons hold hundreds of prisoners, including children, without due process. The rally ended with the crowd singing Happy Birthday to Ahed.